« Leash handles & Anchor plates are now standard. 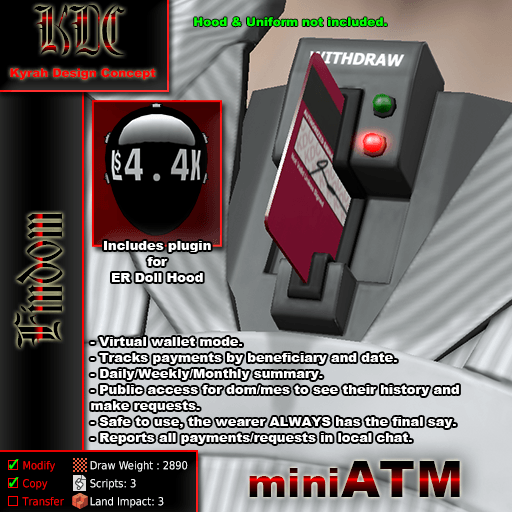 The KDC miniATM is out! Finally! It only took me about a week to complete the model. Code wise, this is a project I have been working on and off for a few months now. My own little “human ATM” toy. It’s quite different from anything I’ve seen out there, in the sense that it is merely a “roleplay facilitator” with a touch of public humiliation, rather than something you would use to sign your rights away unsavory. And that’s probably the only findom related product I’ll ever do. Safe to use, the wearer always has the final say on all payments. Doesn’t require to set an owner/master. Payments and requests are revealed to local chat, great for roleplay! Plugin to display amounts on an ER doll hood. I strongly suggest that you check the documentation on this one, before you purchase, to be sure that this is your kind of toy! As usual, you can get is from KDC’s main shop or the SecondLife Marketplace (it appears that the PrimBay is down at the moment).